Friend us on Facebook: Bennie And The Jets. Follow us on Twitter: Bennie and the Jets. We have a mail list. If you'd like to join our list, we'll let you know when we'll be performing near you. ... join the list, click HERE. Courtesy of our friends at FAR Labs. If you have a mobile phone that's web capable or got a new Kindle recently, point your browser to bennieandthejets.mobi -- an additional domain name for the group. If you, or anyone you know has internet access from a cell phone or tablet, try it out. It's another way to stay in touch with us. We played before our troops who were very enthusiatic and appreciative of our willingness to come all that way to perform for them. We are just as appreciative of the service they provide for us. We had a great time performing and made a lot of new friends and fans. A big THANK YOU to all our troops and the fine staff at MWR for taking care of us over there. It was an experience of a lifetime for us. Here's a VIDEO OF OUR TOUR IN IRAQ & KUWAIT - click HERE . Photos of the trip ARE ALSO UP - - click HERE . On Saturday, October 11th, 2008 Greg & Dan performed at the 5th Annual Lunch Around the World - Manhattan Style in Times Square NY benefiting the Elton John AIDS Foundation. It was a great event for a very worthy cause. Greg and Dan had a great time in NY performing for the LATW crowd and are thrilled by the response they've received from attendees and the coverage they got on EltonJohn.com. 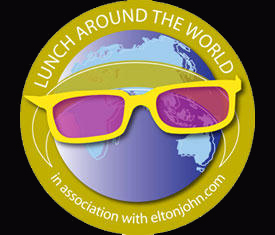 A reporter and camera crew from EltonJohn.com were in attendance at the event to capture all the excitement. Greg participated in Yamaha Piano's Red Piano Tour. 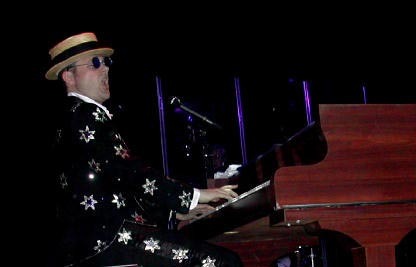 This is the Red Piano that Elton uses in his Las Vegas show. To see the performance, click HERE. Video courtesy of WSHM TV-3. ... check out the Promotional Material. ... check out the Venue Archive. Take a peek at her work & visit our photo album.